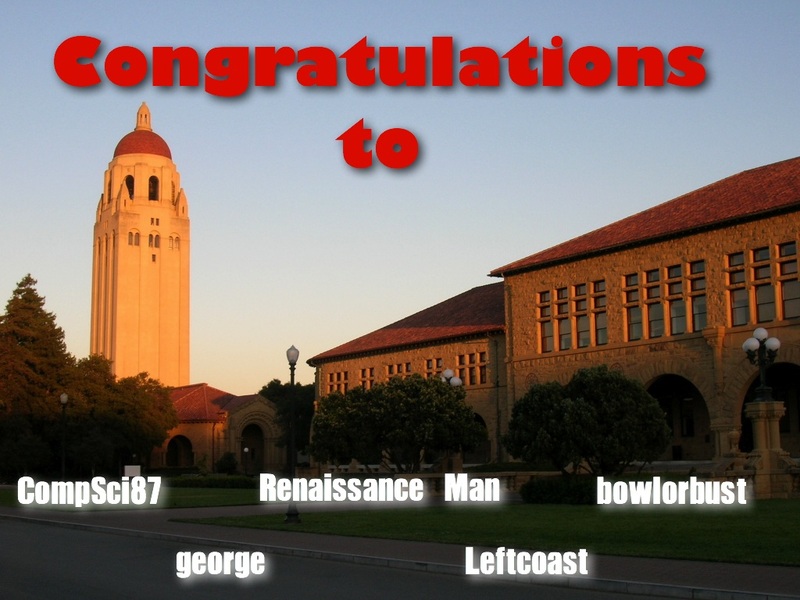 Well done Renaissance Man, Leftcoast, bowlorbust, george, and CompSci87. You got the 5 closest scores to the beautiful, remarkable, unforgettable Stanford 17-14 Oregon that we just witnessed. Please, upvote the posts linked here to reward these visionaries! I've seen similar things in other forums, and I thought we could do it here for this transcendental game (I was also curious to see what the expectations of other cardboarders are). The idea is that everyone posts a score (ideally with a snippet of what you think the game will go), I order them by point difference in this post, and the 5 closest differentials (tiebreakers are actual score, and accuracy of the snippet) win. As a prize we can upvote the posts of the 5 winners. Stanford wins as a stunned Duck crowd looks on in horror and the camera turns to a Red clad Rando dancing in the stands.Â Closer to home the Cardboard erupts with the realization that the UCLA game is for a place in the Pac 12 championship game with the Rose Bowl and the East Bay's cleanest rain gutters in 13 years on the line. Did I mention the Pac 12 Championship would be held at our place? Hey a guy can dream, can't he? I would pinch myself if that (or something like it) happened. My best guess at realism. 45% chance Ducks win and we keep it fairly close (17 point or less deficit). 45% chance the game turns out pretty much the same (hopefully no worse) as it has the last two. I'm going to say 37-35 Oregon.Â Jordan Williamson misses a 48 yd FG at the gun that would have won the game had it been good.Â That would be the only thing more agonizing than the other losses in 2012, but it will solidify Stanford as a Top team and put them in good position to be in the BCS Top 14 with a win at UCLA. ESPN ran the Ducks and the Card through the NCAA 2013 game simulator (even had Hogan as QB).Â Stanford kept it close at the half but lost it by 21 points in the end.Â Final score was Oregon 40-something, Stanford 20-something. I saw a chart that says a 21 point spread translates into a 5% probability of winning for the underdog.Â My gut tells me that we at least cover. My simplified thinking is that the Stanford defense has never been better, but the Oregon offense has never been better either.Â So a wash when the Ducks have the ball.Â The question is whether the Duck's injuries on defense offsets by a of immense proportions degree the so far much less than expected dropoff from Luck to Hogan running the offense. For this exercise, I will do what I do in my day job when asked to put together a forecast and just use what the futures markets says.Â Here I did the quick math and Vegas is expecting the following score: Oregon 43, Stanford 23. Williamson makes a kick at the end 38-35. (I can't watch in pouring rain as it sales through the uprights but the deathly silence makes me know it's good). My strategy is to make very pessimistic predictions and then be absolutely delighted to be wrong. I will say Oregon 53 Stanford 30. That was last year's score.Â Our offense is not as good as a year ago, but the Oregon defense is riddled with injuries, and so I would predict we will score as many points this year as we did last. Our defense is considerably better this year, but so is Oregon's offense.Â More troubling to me is that our defense has played well against conventional teams but played very poorly against offenses that most resemble Oregon's--like Arizona.Â Oregon will be playing with the biggest home field advantage imaginable, with a better offense, in a meaningful game, against a defense that has not handled the spread at all well--I would say Oregon's offense should score as many points as it did a year ago. Now, please, please, please let me be wrong. (11-16-2012, 08:09 AM)81alum link Wrote: Our offense is not as good as a year ago, but the Oregon defense is riddled with injuries..
Now you have Hogan, a QB who is making teams defend the whole field, and is a running threat, plus a deeper Stanford OL, against a very suspect and beat up Oregon defense, so I'm not sure Stanford's offense isn't going to be better this year than last.Â I know Stanford's defense is going to be better.Â If Stanford can run on Oregon like Cal did, Stanford will be right in the game until the end. Our offense jumps to an early lead with a bit of trickeration out of an option pass for a long TD. The defense forces a 3 and out and our offense responds with a long, time killing drive that ends in a field goal. Our defense gets a pick 6, and the Stanford sideline erupts. DAT runs the kickoff back. The Stanford offense stalls. Barner breaks off an 80 yd TD run on 4th and 1 from their 20. They recover an onside kick. They score again. We go into the half down 21-17. We lose 52-34. True that so far the Stanford D has had trouble with spread offenses (Arizona, WSU), but those guys spread it out to pass.Â Oregon spreads it out to run.Â That's what gives me hope.Â As good as the secondary has been this year compared to Stanford secondaries of the past, the front 7 is truly special.Â I've never seen a D with such good discipline about gap coverage. Stanford 31-28.Â A frustrated Oregon offense presses and turns it over three times in the second half. Oregon 48, Stanford 28. I think we're delusionary about our defense. It's good, but it's far from great, as Arizona proved with personnel far inferior to what we'll see Saturday. I also think there's some undue optimism about our offense -- it's essentially had four good quarters in the last seven under Kevin Hogan, which is well short of juggernaut status -- but the battered condition of Oregon's defense should help balance that out. I will be only too happy to eat crow or, depending on the degree of vengefulness, doo-doo, if I'm wrong. But honestly, this is the third year in a row we've swaggered into this game saying we were underrated. We limped back out of the first two, and we had much better teams then. I just can't summon any optimism. I think AZ's skill position players are excellent. Barner is no better than many guys we have faced, Huff isn't Woods/Lee, Lysteria is no better than the ND guy. It's the scheme, not the players. I find myself agreeing with Garvin yet again, at least on the general hypotheses. I do think we hold the ducks to their lowest total of the season. Say, 34. I also think we end up with the lowest total of the Hogan era as the Autzen atmosphere gets to our young QB. I'm guessing 20. So it's Oregon 34-20. If we turn it over 4 times like we did last week, this could get much uglier. Of course, I would love to be wrong and will indulge in gleeful crow eating if it comes to that. Why in the hell....before a single down has been played...would I entertain the thought of losing? Kevin Hogan is a bit hit and miss in the first few drives, but eventually gets things going, but the onslaught starts fast for Oregon and never stops. I have no idea what the final score is going to be, but I would certainly hope that if Kal's offense (lousy as it has been this year) is capable of putting up 17 in 2 1/2 quarters against the Ducks, that we will be able to put up more than 20. After what Arizona did to us (at home, incidentally), I don't see any way we hold Oregon below 40 points at Autzen. I do think Hogan will make some things happen, and that the run game will find some success as long as the game doesn't get out of hand early. In my mind, that's the key: a good start. If we're down three scores before the first quarter ends, the run game goes out the window, and Oregon's backups will be playing in the second half. On the other hand, if we keep things interesting through the first half, we can come out after halftime and keep pounding away at the Ducks' depleted front seven. If we're imposing our will in the second half, we can keep the ball away from the Oregon offense and give ourselves a chance to pull off the upset. Ultimately, I think what actually happens will be somewhere in between, so I'll go with Oregon 49, Stanford 31. We cover and avoid embarrassing ourselves, but I don't see us causing a nail-biter, let alone the upset.